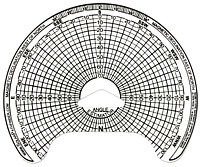 The clear grid lays over the traced diagram and is used to approximate the azimuth (degrees east or west of true south or north), and the elevation (degrees above the horizon) of any object reflected in the Pathfinder's dome. One is included in each unit. The angle estimator is used to approximate the azimuth (degrees east or west of true south or north), and the elevation (degrees above the horizon) of any object reflected in the Pathfinder's dome. Some state and local governments are now using the angle estimator to determine the azimuth and altitude of shading and transferring that information to their own required sun chart or forms. 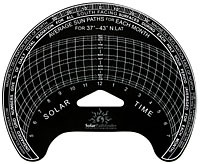 The sun-path diagrams are latitude and application specific and can be mixed and matched to meet your needs. Buy 25 for $10, or 100 for $30.